This is a little late, I am very sorry, major computer issues for me this December. But I am here now, with a little info on the Christmas promotions for 2017! It is the same as always. Open advent calendar windows every day to discover the presents behind them. If you do miss a day, you can open another window, however, it will cost you equus. The price increases for every window you open late. Also, on Sundays you can find a divine horse in that day’s window! This promotion ends on December 25th. First things first, and the most exiting thing; complete the tutorial, and get Blitzen, a divine mare who will help you in decorating your trees! To unlock better trees, you need to decorate smaller trees so Blitzen can gain enough skill for you to decorate bigger and better trees. We get to keep Blitzen after the promotion ends, but she does not have any perks after it ends. Thor is one of the nordic horses. Lift the veil that has descended on the Nordic Worlds by winning points with rides to Asgard, Midgard and Nilfheim. Take care when choosing which ride to go on! When you get 420 points, the veil is raised, and Thor gives you 1 x Zeus’ Lightning Bolt. The pass estimate for Thor is around 50 passes, that is if you only decorate small trees, until you unlock the first tree where you can gain divine ornaments, and then only decorate until the divine ornament level on that tree. Thor requires 11 divine hanging ornaments, 12 tinsel, 12 baubles, and 12 hanging ornaments in total. This promotion ends on January 2nd 2018! Good luck decorating your trees, opening your calendars, and I hope you all have a very happy New Years Eve, and I will see everyone in the new year! 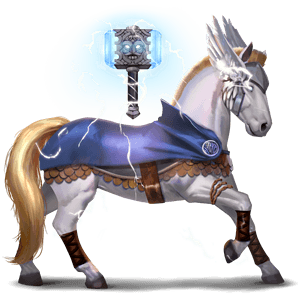 I didn’t get any divine horses on Sundays with the advent… which I guess is okay, I mean I saw/remembered we were supposed to get *something* extra, but couldn’t remember what exactly. I think I got one extra but now I don’t remember and I know it wasn’t a divine.